Plymouth, IN (April 27, 2015) – Bill Davis, Chairman of the Board of Directors of the Marshall County Economic Development Corporation (MCEDC), announces the launch of “Invest in Marshall County,” a four year campaign with the goal of increasing private sector participation to further grow and strengthen the county economy. Economic development is extremely competitive. The most successful programs are based on a number of key elements coming together, and funding from both the public and private sectors is a must. Business Expansion and Retention (BEAR) – Through the use of interviews with business leaders, the BEAR program aims to learn about the issues companies face so MCEDC can develop solutions. In particular, the BEAR program will uncover expansion opportunities, and assist in these expansions. Business Attraction – MCEDC will identify and develop our county’s business assets, and market them to targeted businesses in order to attract new industries to the area. Entrepreneurial Hub – MCEDC, with area partners, will develop an entrepreneurial center, incorporating elements for success and allowing innovative business ideas to prosper. Workforce Development Program – MCEDC, with area partners, will develop an immediate plan to address the availability of workers and ensure that our future workforce has the skills that our employers require. The much anticipated focal point for Yei-Yei’s Game Room arrived this week. 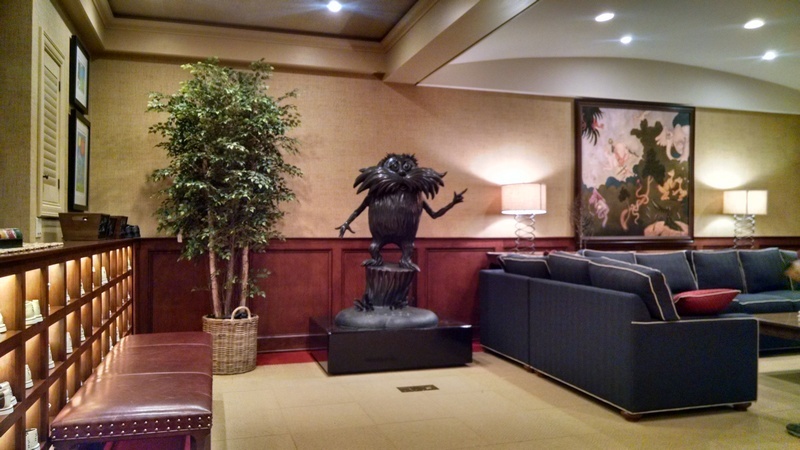 The 600+ pound bronze Lorax has taken his place on the pedestal we built for him. The crew had given me a hard time about over-designing the structure for the pedestal base, but I think they changed their tune (toon?) when it took five stout men to move it into place. The delivery company sent two guys to place it and there is no way that would have happened. We were able to move it around adjacent to the exterior doors with a forklift, but from there it was all Egyptian style moving through finished space… in some cases over wood floors and ceramic tile that had to be protected. Fortunately we were able to accomplish this without mishap. When he realized that he was going to have to help move the statue, John volunteered to take its place rather than do the heavy lifting. That was until it was pointed out that the Lorax is naked in the sculpture. John agreed with the rest of us that, “No one wants to see that!” Poor Lawana! 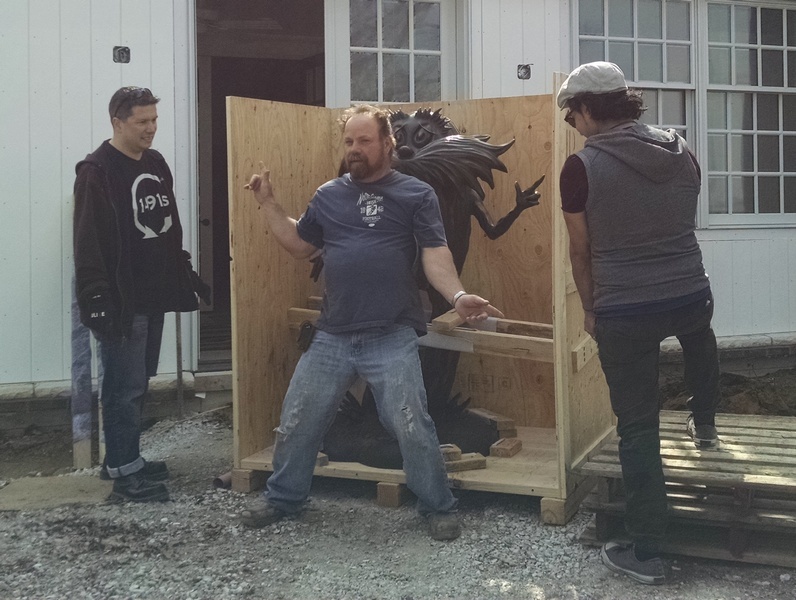 In any case, the statue is in place with no damage to it, the room or the movers. We are pleased to help the Owner realize their vision. The Lorax looks like it was meant to be there… which it was! Please join us tomorrow, May 1st at 10:15am as Governor Pence visits to provide an overview of the 2015 legislative session at The Vault (located inside The Exchange), 112 W. Jefferson Blvd., South Bend. This is a great opportunity for business and community leaders from our region to thank the Governor for his advocacy of the Regional Cities Initiative and for making it a priority in budget negotiations with the legislators. Also to demonstrate the great enthusiasm and regional collaboration occurring in north central Indiana as we now move forward in the competition to earn half of the $84M slated in the budget to support our Regional Cities of Northern Indiana projects. If you are not able to attend the update, please consider sending a note to Governor Pence via his constituent representative at: kkane@gov.in.gov. Having the governor hear a huge thank you from the business community will be extremely helpful for future funding years. We are currently helping the Ole Olsen Theatre troupe in Peru, Indiana with repairs to the dormers on the old railroad depot that they use as their base. The old wood siding on the dormers have gaps to the point that our crew said you could see from one side of the dormers out through the other side! We are replacing the old siding with vinyl and wrapping the existing window trim with new rot resistant materials. The window glass will be protected and insulated with Lexan covers. It’s unfortunate that the previous roofing project was poorly executed. 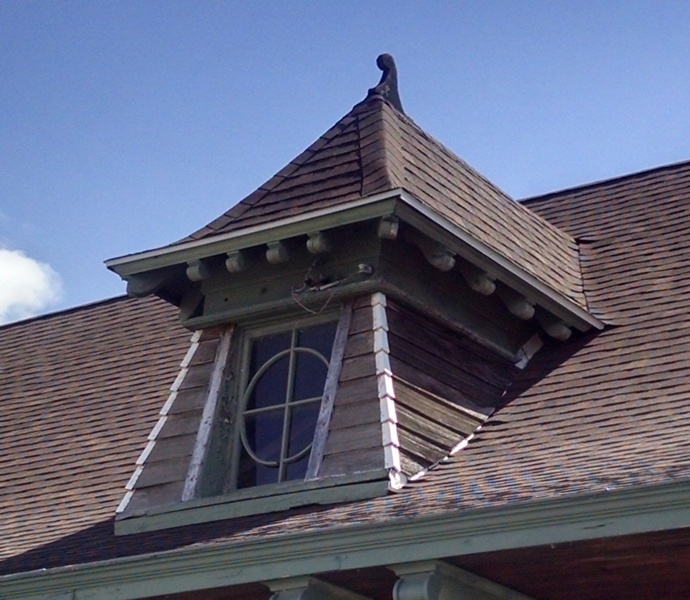 Flashings were not installed properly around the dormers causing damage over the years. The shingles were not properly laid out, so the lines are uneven and do not match on either side of the dormers and there is a round turret where the shingle line waivers up and down as it rises. All this detracts from what is an impressive historic structure. The details on the building are quite impressive, though as is often the case with historic structures, neglect has taken its toll over the years. Bob Cooper and Ken Stiles have been our crew on site and they are struggling to fix past mistakes and blend the new work to fit with the historic structure. This postcard supposedly shows the first CR&M (C&O) depot in Peru, Indiana. I would rather think this really the freight house, even though it resembles a depot. 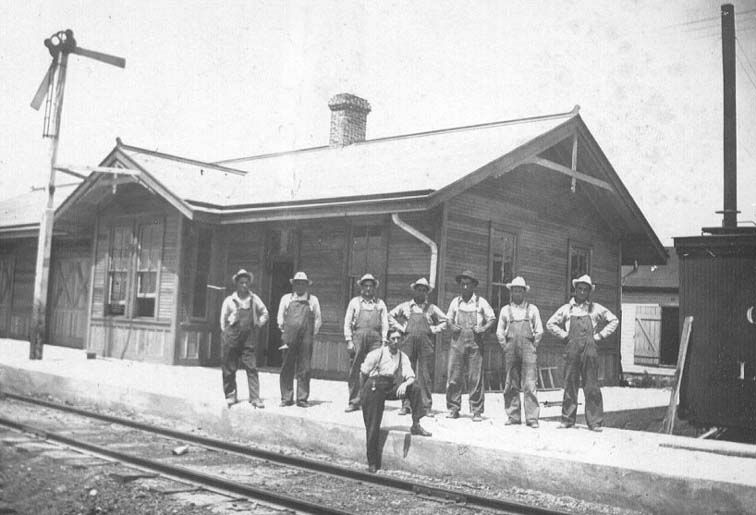 The brick and stone depot was built in 1901, which was the year the CR&M started running to Peru. I can’t explain the train order board. I did talk with a C&O retiree and he said he remembered the building as a yard office after it had been moved near the river. I am open to comments on this one. Postcard from Bob Albert collection. Apparently there have been a plethora of gawkers sharing their comments and perspectives with Bob and Ken. One of them spoke very authoritatively on the structure and stated as fact that the structure was over 200 years old. The guys found that a little suspect since the State won’t be celebrating its 200th birthday until next year. I did a little internet research, which I admit is also always a little suspect, but I found references to the railroad first coming to the Peru in 1854 on the Indiana Transportation Museum site. Since is seemed a little unlikely that the depot was built in anticipation of the railroad that didn’t arrive for another 40 years, I did a little more digging. 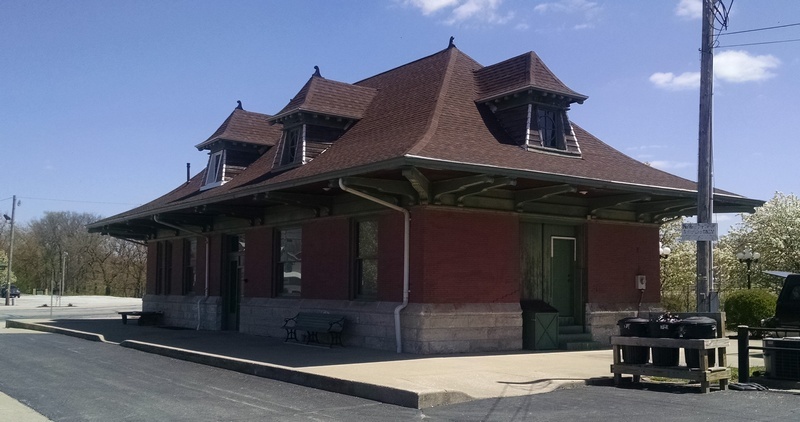 I found the picture to the right showing a picture of the original depot with a reference to the current brick and limestone depot being constructed in 1901 on the Hoosier Valley Railroad Picture page. 114 years old is still impressive, but a little short of the 200 year claim. Historic structures are always interesting and challenging. We are attempting to be cognizant or the theatre troupe’s limited funds, where more extensive work might be appropriate. We want to thank the Ole Olsen Theatre Troupe for their faith and confidence in Easterday Construction Co., Inc. The Affordable Housing Task Force met on Monday the 27th to discuss the information Jonathan Leist, Culver Town Manager, had assembled through various meetings. I attended four of the six meetings he reported on and was able to help fill in background. In a nutshell, there are opportunities and developers that can be enticed to do work. In a MCEDC site visit with Elkay, we were able to recruit Elkay’s management to assist us in our endeavors. Two Elkay representatives attended the Monday meeting and brought demographics for our use. They also volunteered to help with surveying to determine how many Elkay employees would be interested in relocating to Culver if housing were made available. In the meeting with IHCDA, we learned that funds are available, but only for income based housing projects, not market based housing. We did find that much of the projected income based rental rates are actually above the local market rate rents. The Task Force agreed that it would be prudent to pursue both market based and income based housing to keep our options open. The group tasked Jonathan to take a couple of things before the Town Council: 1) A budget for a Needs Assessment Survey and 2) A tentative agreement to consider tax abatement for the properties. (Tax Abatement was requested by all of the developers Jonathan met.) Jonathan accomplished #2 at last night’s Council meeting, but #1 was not approved as it would require an additional appropriation for the unbudgeted cost.